Monday already?!!! How did that happen? I hope you all stayed safe and warm this weekend. It snowed pretty much non-stop here, so we stayed inside all weekend long again. No complaints on that front, I've read a book cover to cover each weekend which has been quite enjoyable. Bella has been teething, two little toofers popped through at the same time and she's been pretty miserable. I feel so bad. For us too LOL- she didn't take a nap at all Saturday and it made for a looooong day. We got her in bed with us in the afternoon after I gave her some Motrin and a teether from the freezer and she passed out for 10 minutes until I got up to get some lunch. Jokes on me! 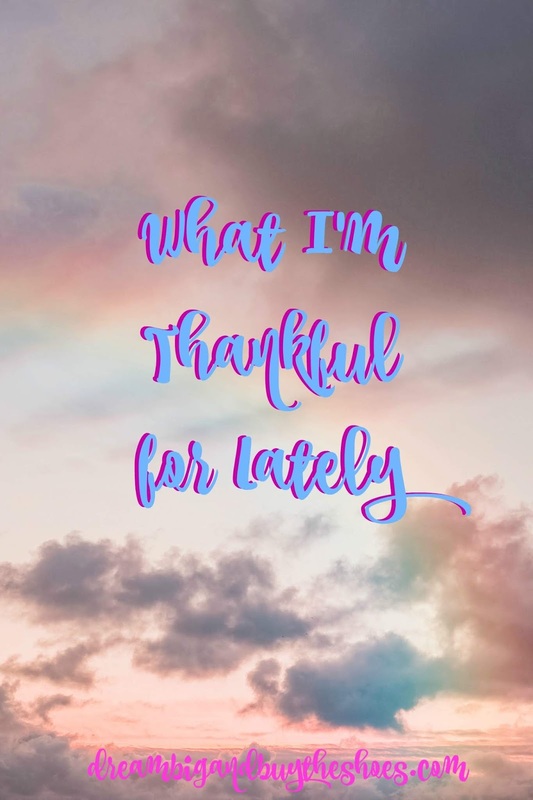 For the sake of ending the whining there- I thought I'd share some things I'm thankful for as of lately. It's important for me to do this from time to time- to intentionally write it out and realize how wonderful life truly is. Bella started walking last week. It was the craziest thing I've seen, besides her being born. Her and I were playing in her room after her bath while Chuck and Ethan had ran some errands. She was standing behind me- I could feel her touching my shoulders and then next thing you know she's walking across her room squealing and laughing. THE CUTEST THING EVER! Of course I started bawling, called Chuck and then proceeded to FaceTime every family member to watch it LOL. We had so much fun that first night watching her do it over and over again. She still prefers crawling since she's faster, but she's been walking more and more and it's hilarious to watch her stumble around and get so excited. You can see a video on my Instagram! Ethan has really stepped up and been helping more and more with things around the house and he's such a sweet big brother. He holds Bella, helps with her, he even ran the snowblower yesterday. I've been trying to be more aware and thank him for his help and kindness repeatedly so he knows how appreciative we are. It's been a while since we hung out, just the two of us- so we went bowling last week and had a bunch of fun. He cracks me up with his dancing and silliness and it was good to do that with him. I'm thankful for the shuttle that drives me and other employees from the parking garage to our office each morning during these miserably cold temperatures. Normally I don't mind walking it in the cold, but being sick (STILL) and slushing through the wet snow at 7:45 am isn't the most fun, so I've been taking advantage of this perk. I went to Aldi's last week and stocked up on a bunch of goodies- so cheap. All the praise hands for cheap and delicious guacamole! Speaking of food, how awesome is it that homemade rice krispie treats are so easy to make? I whipped up a batch last week after I thought to by some ingredients at Aldi's and it took about 5 minutes and the kids love them. Heck, so do Chuck and I! I'm super thankful for cozy hoodies and great smelling candles on these winter weekends and happy that it feels so good to just relax and take it easy in the comfort of our home. Writing this out makes me feel like it will be a great start to the week. What's something you're thankful for? Hope you have a wonderful week ahead, xo!